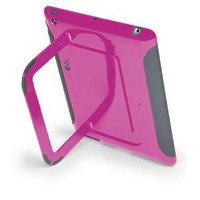 A durable, sturdy case from Case-Mate, this flexible plastic shell in pink and gray lets you handle your iPad without fear of scratching or banging it. The combination of plastic and rubber provides shock absorbers, scratch resistance, and shielding from impacts. There’s no cover over the front, but the lips over the cover let you lay the iPad face down without the screen touching the table. The built-in kickstand is a convenient feature; it lays flat within the back and pulls out to hold the iPad upright in the portrait or landscape position. We just wish it would lock into place for extra security. The case is available for $49.99.